Shout out to Svaglic for PM’ing me that one of these came up for sale recently on the Bay. Very much appreciated. Long time coming, I’ve been casually hunting these models (both the 001 and 003 4s15-7000) for quite some time. 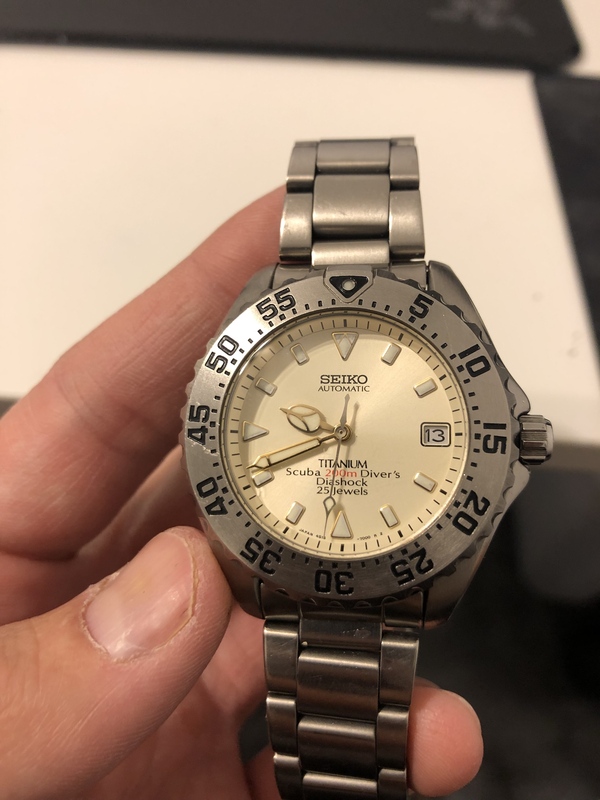 These are sort of the grail watch model series for mid 90’s Seiko mid range, as they have a number of outstanding features. Not the least, an extremely reasonable and comfortable 40mm case! 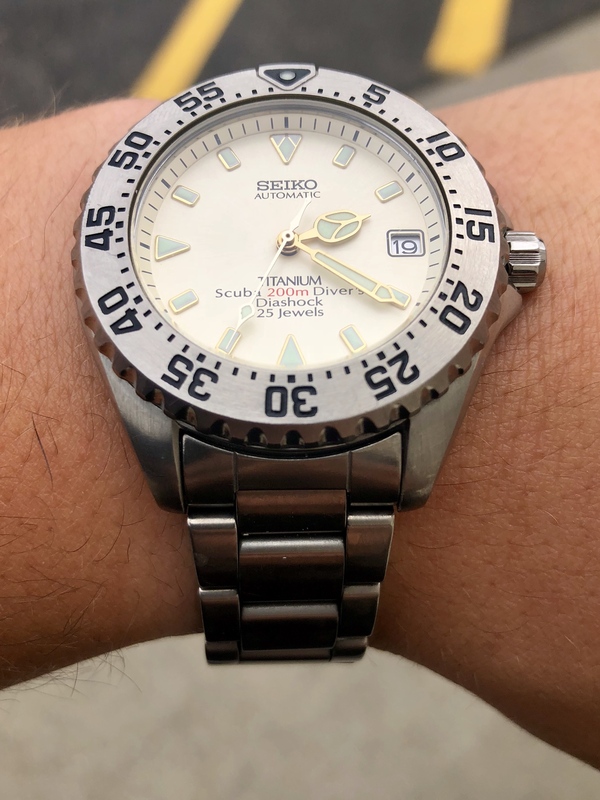 Hallelujah, a modestly sized Seiko diver. 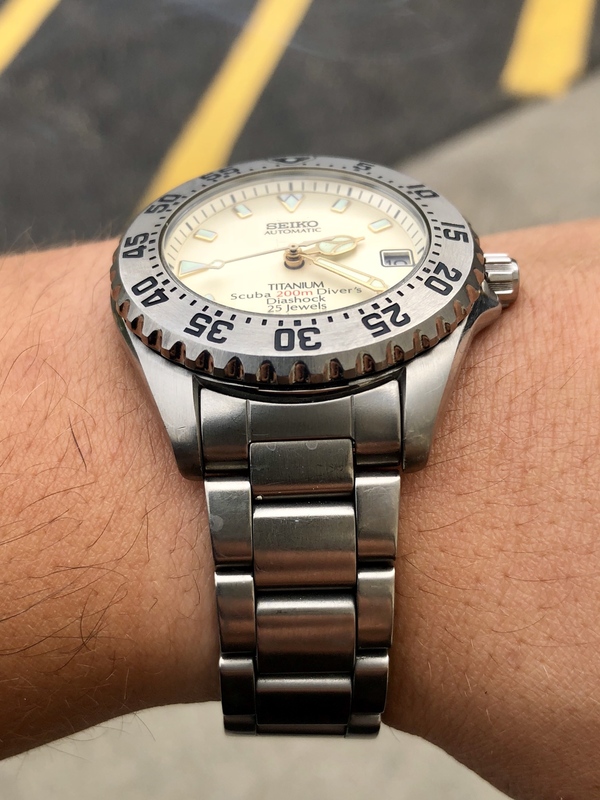 Add to that the fantastic 28,8k bph 4s15, titanium construction, a monocoque case, and a primitive but cool ratcheting diver’s clasp, and you have a very unique and interesting dive watch that exemplified Seiko’s efforts at an upmarket resurgence of automatic watchmaking in the 90’s. These models fed directly into the also short lived SKX403 titanium dive watch, but with a 7xxx series movement. 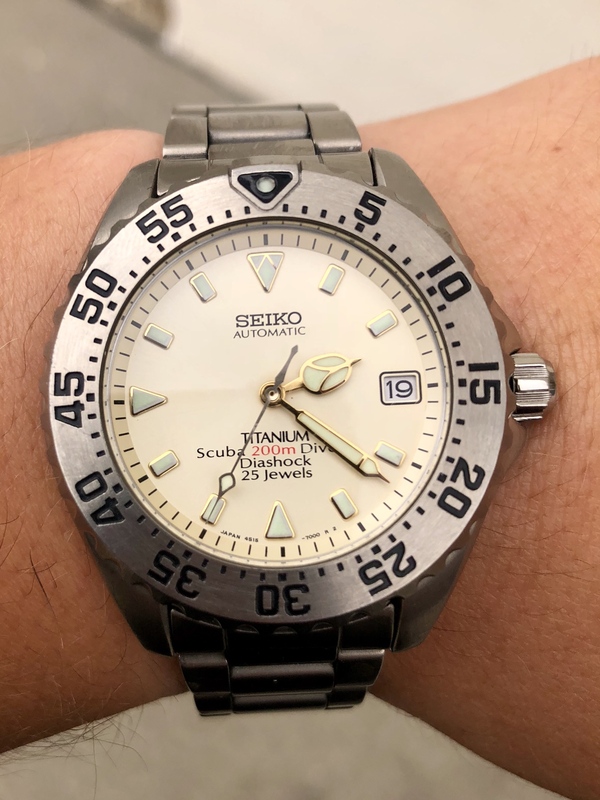 These were produced only for 2 years in the mid 90’s, so along with their sister Alpinist models (SCVF005, 007, 009), they are relatively rare and appreciably interesting for a Seiko collector. Very happy to add one to my collection, alongside my Alpinist SCVF005. Just look at that cream dial. It’s on my list, but not the immediate list. I love that watch, it’s defiantly a worthy goal and a keeper. Really nice. 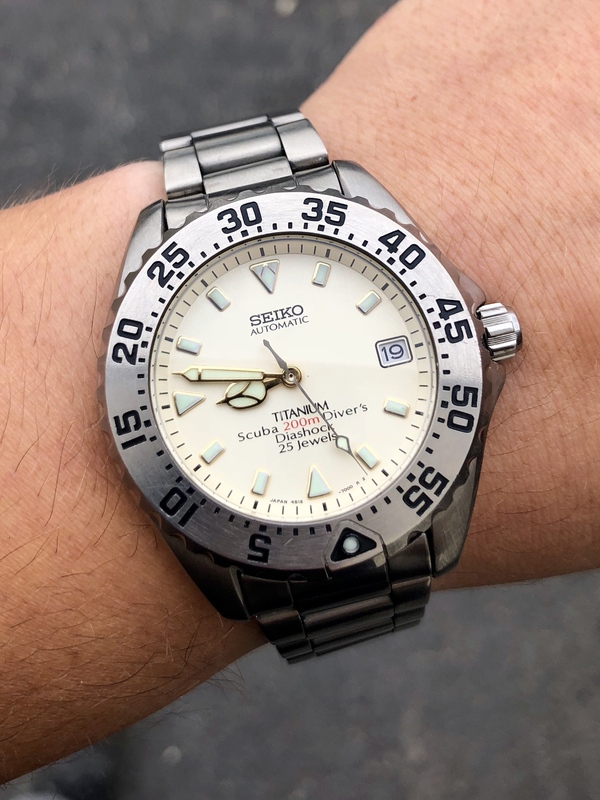 I’m a sucker for cream dials and that size is rare for a diver these days. svaglic wrote: ... It’s on my list, but not the immediate list. Looks to be in pretty good shape given it's age and titanium makeup. Love the dial color as well, congrats. I can't keep up with you man- I'm still looking for a orange and blue turtle for less $ than being dry humped. Excellent! Well done, for all involved! Creamier than A&W, man. Nice pickup. First full day of wear, it completely disappears on the wrist. Very nice watch, looks good at all angles I think.